John W. Boettjer, 33", G.·. C.·. and the farm folk of Midwestern U.S.A.
of this or any other century." He lives on through his art. The monument (pictured in color on the front inside cover of this issue) memorializes an ardent Free-mason and humanitarian who was one of seven children born to a Hunt, Illinois, farm family. He learned his first tunes and folk ballads from his pipe-smoking grand-mother, and by age four, he was singing in his grandfather's church. Entertaining became an avocation as he studied at Eastern Illinois State Teachers College and New York University, but in 1938, following his success on Broadway in The Boys from Syracuse, he became a full-time performer on the concert and theater stage, in radio, film and television. Often, he performed for charities, including the Scottish Rite of Freemasonry and the Shrine. Famous for such folk songs as "Jimmy Crack Corn," "Big Rock Candy Mountain" and "Blue Tail Fly," as well as for his lead role in the folksinging group "The Weavers." Ill.·. Ives was also an actor of note. He starred on stage throughout the United States and in Europe, and in such major motion pictures as "Cat on a Hot Tin Roof" and "The Big Country" for which he won an Academy Award. He also starred in the television comedy series "O.K. Crarkerby" and the drama "The Bold One." 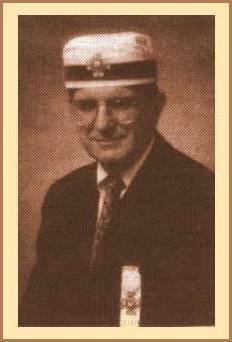 Brother Ives was involved in Freemasonry as a youth, becoming a DeMolay on December 5, 1927. Then, after moving to California, he petitioned Magnolia (now Magnolia-La Cumbre) Lodge No. 242 and, in 1977, The Scottish Rite Bodies of Santa Barbara, California, becoming a dual member in the Valley of Bellingham, Washington, in 1990. In recognition of his many services to our Order, he was invested with the Rank of Knight Commander Court of Honour in 1985, coroneted an Inspector General Honorary in 1987, and elected a Grand Cross by The Supreme Council in 1993. Dorothy Ives, following what she feels would have been the wish of her beloved husband, has had a Grand Cross emblem engraved on her husband's monument. "He loved Freemasonry," she says, "and I know this is what he would have wished." In addition, Mrs. Ives has donated over 200 of the items collected by Ill.·. Bro.·. Ives throughout his long career. 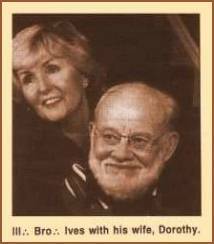 With Dorothy's personal involvement a special Burl Ives Room is being prepared in the House of the Temple to display the Burl Ives Collection, and plans are to dedicate it near the second anniversary of his death, April 14, 1997. Appropriately, the passing of Ill.·. Bro.·. Ives was marked by a memorial service held, under the auspices of the Grand Lodge of F..&A..M.. of California on May 4, 1995, at the Scottish Rite Cathedral in Los Angeles. Also, following graveside services by the Reverend Stephen Willis, Pastor of the First Baptist Church of New- ton, Illinois, the officers of The Most Worshipful Grand Lodge of A.·.&F.·.A.·. Masons of the State of Illinois assembled on May 15, 1995, at Mound Cemetery to conduct a memorial service of the Craft for Brother Ives as a courtesy to his home Lodge, Magnolia-La Cumbre No. 242, of Santa Barbara, California. The cremains of Bro.·. Ives were then placed in the grave. Just as his life was replete with colorful tales and anecdotes, the monument marking his resting place is characterized by many fascinating details. Dorothy Ives never thought her husband, so long a resident of California and Washington, could be memorialized by someone so removed by age and geography from her husband, yet the moment she met Liz Hartrich-Goss, Art Director for Clark Memorial in Newton, Illinois, she knew Liz was the perfect person for the job. They met at the interment of the cremains of Brother Ives and became instant friends. Commenting on the assignment, Liz said, in a February 26, 1996, Newton-Press Mentor front-page article, "I feel very privileged to have been asked to do the etching" for the monument. Dorothy Ives sent Liz a CD of Burl's ballads and several photographs. "These helped since I wanted to get the eyes just right:' Liz said. "My goal was that I wanted people to be able to look at Burl's eyes and wonder what he was up to, to see that little mischievous look he had. I really wanted people to look at this etching and feel Burl's presence. Where I live, I can look out my front door and see the Mound Cemetery where Burl is now buried. While I was working on the project, I went to the door and looked over to the cemetery. At one point I said, 'Look Burl, I'm doing this for Dorothy. I want to make her happy.' I went back and continued working on the etching. I know it seems strange, but at times I really did feel his presence while I was working." Mrs. Ives regards the etching as a complete success. "No matter where you stand:' she says, "it seems like his eyes are looking at you. And Liz has made the monument as solid and earthy as Burl. I love it!" 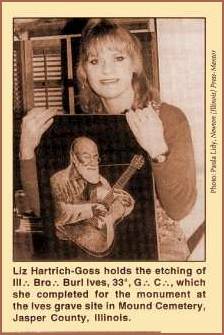 Liz Hartrich-Goss has given the same personal touch to a plaque she did for the Moody Blues, and right now she is working on etchings of John Wayne and Elvis Presley. Nor is the Mound Cemetery monument the only tribute to Brother Ives in Jasper County. Recently, the bridge located on Highway 130 at the north entrance to Newton, Illinois, has been named the Burl Ives Bridge. In late 1995, State Representative Charles A. Harke sponsored House Resolution 56 which dedicated the bridge to Ives, and the Illinois Department of Transportation was directed to erect a plaque near the bridge honoring this great American. 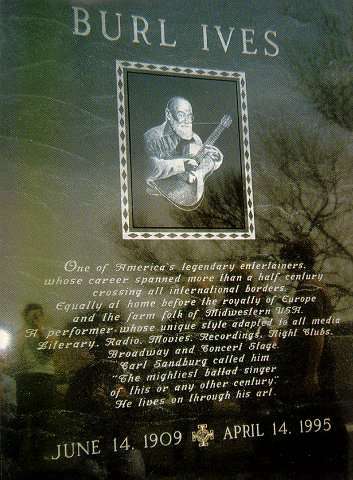 In addition, there is a "Home Place of Burl Ives" museum dedicated to preserving the history of his early life. The Scottish Rite, Southern jurisdiction, is proud to have had so illustrious a Brother in its ranks and deems it a high privilege to dedicate a room in the House of the Temple to displaying the Burl Ives Collection. As the great American poet Carl Sandburg said, Brother Burl is "the mightiest ballad singer of this or any other century." To this, we would add dedicated Mason and outstanding Scottish Rite Brother--a great man and Mason to be remembered and revered, always. John W. Boettjer is a former professor of The George Washington University, Virginia Military Institute. and Michigan State Univ. A member of Cypress Lodge No, 295, Naples, FL, the S.R. Bodies of Alexandria, VA; Kena Shrine Temple. Fairfax VA; Adoniram Zabud Council No. 2, Wash., DC: the Royal Order of Scotland, and National Sojourners, Inc., III.·. Boettjer ii a 1993 recipient of "The Distinguished Service Award" from The Philalethes Society, Americas most outstanding international Masonic research society. He has been Managing Editor of the Scottish Rite Journal since 1989.